Hailing from Austin, Texas, Michael A. Muller has graced us with his truly authentic and heartwarming imagery for a range of memorable American portraits on Freunde von Freunden. As a trusted and valued FvF contributor, there is a strong commitment to his craft evident in his work. Michael has introduced us to three FvF guests from Austin. You might remember shop owner Don Weir in his home and store, architectural designer, Jack Sanders offering a true Texan flavour and artist and designer, Alyson Fox. Additionally, Michael also took photos for creative director and designer, Joe Sadler‘s portrait at home in Silverlake, Los Angeles. When not working on content for FvF you can find Michael on a shoot for a range of restaurant features, or producing material for Cereal, Kinfolk, Monster Children, Nothing Major, Remodelista and Sight Unseen, among others. We get to know Michael a little better and find out about his love of the simple pleasures in life: an early morning jog, a hearty breakfast and reading a good book. We also find out about his favorite childhood travel memories, love of printed magazines and the best place in town to overdose on oysters. The morning time. I’m an early riser and love doing something active first thing when I wake up. Some days I go for a jog with a good podcast and other days I go to the skatepark with friends and try to retain what’s left of my youth. Everyday I make a nice breakfast and drink perhaps too much coffee before delving into the workday. I usually unwind at home with a book or magazine and listen to records – with a good wine. For inspiration, I’ll try to get outside and go for a hike or a run on one of the many trails in and around Austin’s creeks and rivers. It’s a necessary tool to function normally in society these days. I can’t remember how I managed to successfully drive to unfamiliar places before Google Maps. I definitely embrace technology and enjoy seeing developers push its limits. However, there is nothing like the weight and texture of a nice paper stock in your hand or the sound of a needle on a 180g record. Analog media still has a firm place in my world. Growing up my mother was a flight attendant for American Airlines so we’d get hugely-discounted flights. This afforded my family some great holidays. We would go someplace tropical like Grand Cayman, Jamaica, or Hawaii every summer. My brother and I would explore beaches and forests and drink piña coladas all day. I love food and I do a fair amount of photography for restaurant features, so I like keeping abreast of new cafés in my town and in my travels. The design and details of a space and their branding is very interesting and important to me. Leigh and I love a place in our neighborhood called Clark’s Oyster Bar. We never tire of going there for happy hour martinis and a mix of East and West coast raw oysters. RSS feed aggregator (Feedly), Thrashermagazine.com and MLB.com. Who or what would you like to see featured next on FvF? I’d love to see more behind-the-scenes pieces, like features on the contributors and editors of FvF. What is your favorite interview on FvF? I was turned on to FvF by my friend and FvF contributor Brian W. Ferry. My introduction to the site was through the features he shot. I always love his way of seeing a space and its relationship to light. I’m not sure I have an absolute favorite, but a lot of Claire Cottrell’s photos on FvF really stand out to me. 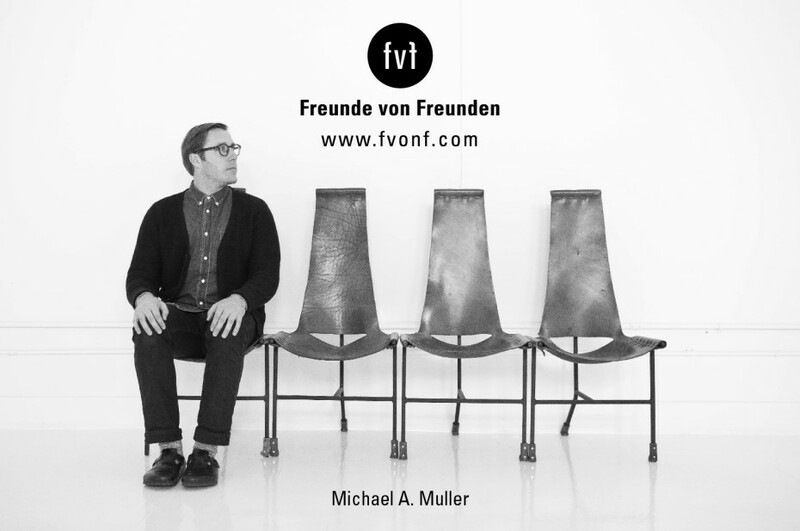 Thank you Michael for continuing to provide your talent behind the lens for Freunde von Freunden. If you want to check out all of his portraits on FvF, click here.